I found this recipe for baked donuts awhile back on pinterest. 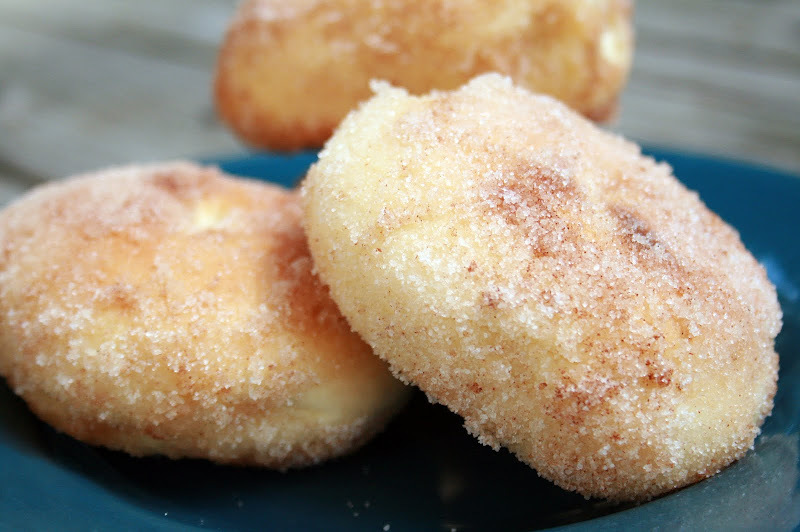 Baked, not fried donuts. Much better in my mind, health-wise (and much better that the house didn't have to smell like greasy yuck all day). I made them yesterday morning along with quiche lorraine and a fruit salad and we had a yummy brunch. While they don't taste quite the same as a "real" donut, they are quite good. They keep well, and taste like they are right out of the oven if you heat them back up in the toaster oven or microwave. Place 1/3 cup of the warm milk in the bowl of an electric mixer. Stir in the yeast and set aside for five minutes or so. Be careful that your milk isn't too hot or it will kill the yeast. Stir the butter and sugar into the remaining cup of warm milk and add it to the yeast mixture. With a fork, stir in the eggs, flour, nutmeg, and salt - just until the flour is incorporated. With the dough hook attachment of your mixer beat the dough for a few minutes at medium speed. You want the dough to pull away from the sides of the mixing bowl and eventually become supple and smooth. Add flour if the dough is too sticky or milk if it is too dry. Turn it out onto a floured counter-top, knead a few times (the dough should be barely sticky), and shape into a ball. Transfer the dough to a buttered (or oiled) bowl, cover, put in a warm place (I turn on the oven and set the bowl on top), and let rise for an hour or until the dough has roughly doubled in size. Punch down the dough and roll it out 1/2-inch thick on a floured countertop. Cut out donuts using a 3 inch biscuit cutter and stamp out the middle with a small round object - I used a straw and then kind of stretched the hole bigger. Transfer to a cookie sheet sprayed with cooking spray, or use parchment paper. Cover with a clean cloth and let rise for another 45 minutes. Bake at 375 degrees until the bottoms are just golden, 8 to 10 minutes - Around 8 minutes, I flipped each donut over to get the nice brown on each side.